LUNA Bar announced Tuesday it will pay each member of this summer’s USWNT a $31,250 bonus for making the roster, which is expected to be announced in the next couple weeks. And the players are appreciative. “We were blown away, because often the lens that we see the fight for equal pay is not a fun or pretty or celebratory one,” said USWNT striker Christen Press. “It’s a fight. It’s tiring, so it’s kind of a second job off the field. 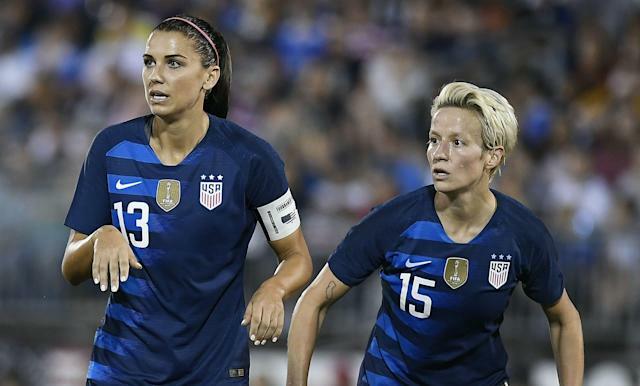 Press identified the 2015 Women’s World Cup victory as a big moment when the players realized their own power, while fellow stars Alex Morgan and Megan Rapinoe noted their discrimination claim filed with the Equal Employment Opportunity Commission in 2016 and said the lawsuit is a continuation of that. First observed in the United States in 1996, Equal Pay Day is designed to fall on the date that symbolizes how far into a given year women must work to equal what men earned in the previous year.